We, at CEC, value the views of our investors, shareholders and all stakeholders. Your feedback helps us measure our performance and identify areas for improvement, as part of our ongoing commitment to effective communication and good corporate governance. If you are a CEC shareholder or are interested in the Company and receive regular information from us or on the Company, then we invite you to complete our survey by clicking the link or image below. 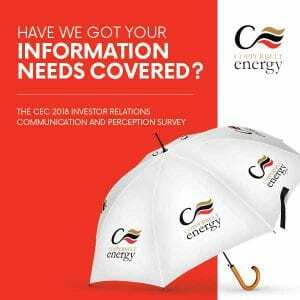 The first 100 respondents that fully complete the survey will receive a CEC branded umbrella (for collection at both our Lusaka and Kitwe offices). Please be sure to record your name at the start of the survey to qualify. Answering the 25 survey questions should take not more than 15 minutes. Please complete the survey in one sitting as you cannot save it and return to it later. You can only complete the survey once but feel free to share this survey with other people in your online community that have an interest in CEC. Should you have any questions or need assistance with the survey, please contact our online investor support centre. THANK YOU, FROM THE CEC INVESTOR RELATIONS TEAM.